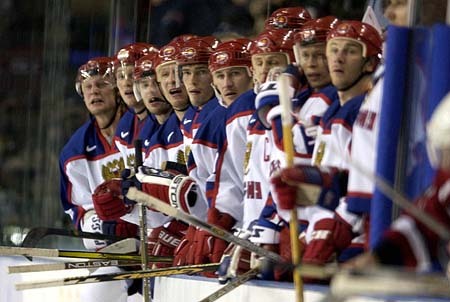 Russia’s 2002 Olympic squad, one of the most star-studded Russian rosters ever, was coached by Vyacheslav Fetisov. With Nikolai Khabibulin in net, this team was expected to do better than in 1998, being one of the favourites to win gold. In the quarterfinal Russia pulled off a revenge victory against the Czechs, yet could not outmatch the Americans in the heart-stopping semifinal. After being dominated for two periods, Russia stormed out with two goals early in the third period, but a miracle saved the US from a tied game. Sergei Samsonov rang a shot right into the net, in which goalie Mike Richter’s glove was located. The puck then deflected off a post and out. The goal was not counted. It was a great game, with an unfortunate ending. Russia beat the surprising Belarusian team for the bronze medal, which was well deserved, but not enough to call the Olympics a true success for Russia. These Olympic Games marked the first time that the NHL took a break and allowed its stars to join their national teams to try and win gold. Canada and the United States were the obvious favourites going into the Games, considering Canada’s depth at every position and the Americans’ victory at the 1996 World Cup. 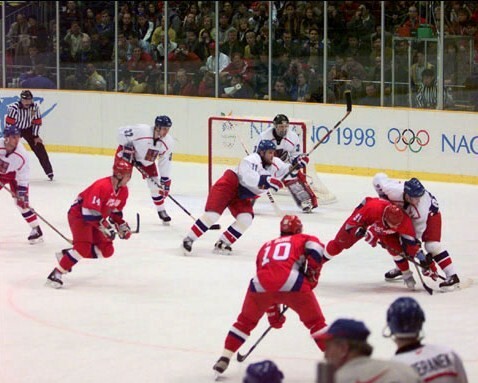 From the 1994 Olympics to 1997, Russia’s hockey team never made it past the semifinals. For the Nagano Olympics, coach Vladimir Yurzinov compiled a roster of big defensemen and mostly small forwards, with unspectacular goaltenders. 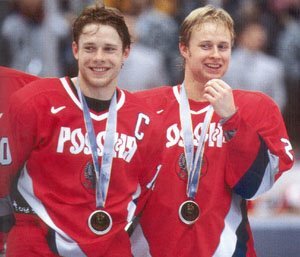 However, Russia went undefeated until the final, with Pavel Bure leading Russia’s charge and Mikhail Shtalenkov demonstrating the best goaltending of his career. Russia lost the gold medal by only one goal, scored by Petr Svoboda for the Czechs. However, the real hero of the final was goaltender Dominik Hasek, who shut out Russia to bring Czech Republic their biggest sporting victory ever.